Find and compare the best prices from a range of well known car rental companies at Podgorica Airport. This is a free to use facility, enabeling you to book direct with the company quoting the price. The modern airport terminal buiding was opened in 2006. 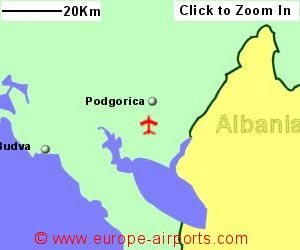 A taxi ride into Podgorica is likely to cost 12 Euros, or 70 Euros to Tivat. Facilities include a cafe/restaurant, 3 shops, bank, and ATM. 1 million passengers passed through Podgorica airport in 2017, a 26% increase from the previous year, and putting it very close to the number for Tivat airport.